How would you plot the proportion of observations by a categorical variable, for multiple facets of your data? Here we do it with the tidyverse. 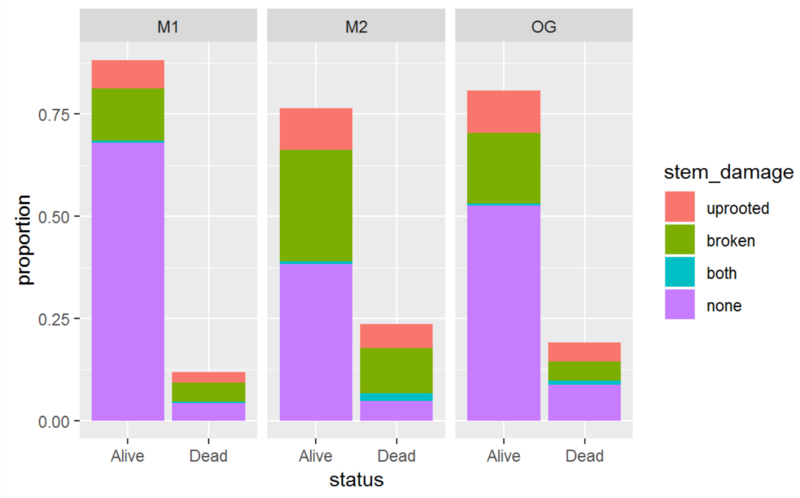 We use a (private) dataset on the damage recorded on dead and alive trees at three different sites. We recode the values of three variables to make them more informative. 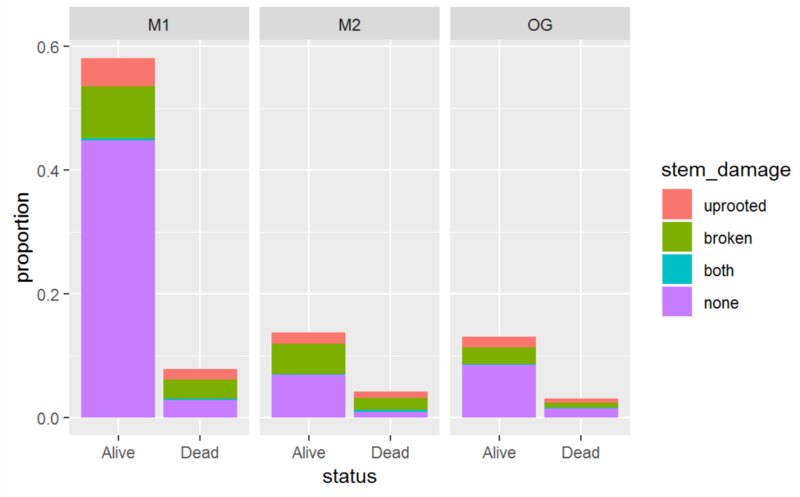 site == "SB3" ~ "OG"
status == "D" ~ "Dead"
We also rename a variable, make it a factor, and reorder its levels, so that they appear in the plot in the order that best tells the story we want to tell with this dataset. Now we compute on each site separately. We create a helper function to calculate the proportion of stem damage in each status category. Our helper does the computation for one site. Now we apply the helper function to each site with map(). We use nest() to work within a dataframe. Finally we plot each facet of our data in a different panel. Note that the values within each panel add to 1. We first calculated the proportion for each site directly within the ggplot with stat(), hoping that the calculation would be applied to each facet of the data independently. But this didn’t work: The proportion was calculated not for each facet independently but for the entire dataset. If you know how to adapt this approach to plot what we want please let us know.